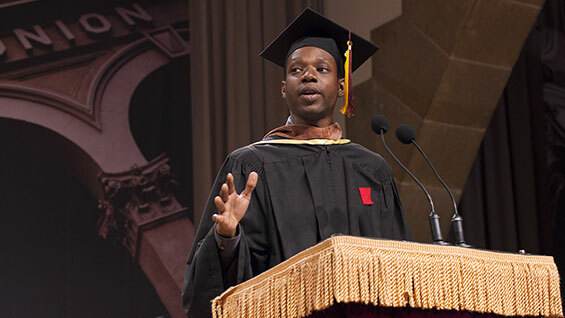 James Allister Sprang, graduate of the School of Art class of 2013, wrote and delivered the Student Address at the 154th Commencement of the Cooper Union for the Advancement of Science and Art. You can read the text below. At certain points (indented) the graduating students repeated each line en masse. What is doubt? Before we can begin celebrating our achievements I believe it is important, in this moment, to excavate the notion of doubt. Doubt is surging through me right now. It is a sensation that each of us has endured in our efforts to get here today. Along the way, doubts have been both productive and counter-productive, having induced fear, doubts have fueled both our moments of empowerment and our moments of inhibition. In this moment, doubts may fuel a conflict with your passions. Your doubts may spark a sense of disorientation, now that you must live outside the cocoon of this institution. Your doubts may bring forth thoughts of the thousands of minority and undocumented persons that may no longer have the opportunity to acquire the free education we have enjoyed. Your doubts may conjure up notions about the work force we are now obliged to join. These doubts are predicated upon expectations forged inside and/or outside of ourselves. These expectations are founded upon hope. All of our current doubts are perched upon a branch of hope. It is not a stretch by any imagination to say: we doubt because we hope. I am not asking, by any means, for us to dismiss the aforementioned. Rather, I am asking for us to accept our doubts for what they truly are. A wise man once explained to me the intellectual currency created in locating the origin of what we are presented with, in this life. He said, it is an enlightened individual who can see the compost in his food, and the trash in a flower. Let us take time to find the hope in our doubts. Once we cut through the foliage, the myriad of doubts and feelings we all have in this moment, are we not hopeful after it all? Today, let us celebrate hope. Today is truly a wonderful day. President Baruscha, distinguished guests, family, and fellow graduates we gather here today in celebration of another graduating class. We embody yet another group of adults that have written “Free education for all,” across our chest—some more literally than others. We might be one of the final classes to bear witness to the enduring strength of a mission statement that will never be forgotten. It is fitting that Peter Cooper, in graduating classes such as ourselves, has created an allegiance to the labor and self-realization earned by a free education. What makes us exceptional, what makes us all The Cooper Union for the Advancement of Science and Art, is that we have been unified in a prestigious effort to advance ourselves within our disciplines. What binds us transcends our fiscal backgrounds and the half of our brains that we most readily identify with. Whether you are an engineer, an architect, or an artist you have earned the right to answer the question, “What do you do?” With the words, “I am a creator. On this wonderful day, we celebrate the union of creation and philanthropy. This legacy is predicated on hope. It is unconfined by the structure of this institution. It is larger than this institution. We will forever be pupils of the philanthropic foresight necessary to create. Peter Cooper has shown us that philanthropy, in partnership with creation, is hope. I would like to ask for you all to assist me in filling this Hall with our voices. Graduates, please stand. Let us speak for those who cannot, for those who will not, and for those who have now lost the ability to do so. a dull or dangerous thing. to doing a dangerous thing with hope. Is what I call art. Hope is a way of doing. Please remain standing. It is time for congratulations. I do not need not expound on the arduous and tenacious work that was necessary to get here. We have created this moment for ourselves. I have been put on this stage to tell you, and to reaffirm, despite however redundant it may sound: For this we should be proud! Let us take a moment to be present in what we are leaving behind. Cooper Union Graduates of 2013, please, stir the hope in the air with your palms and give yourselves a round of applause. We possess more jope in this moment than many of the other moments that we have lived. Allow this notion to catapult whatever is inside of you. Soar with it. And always remember friends, that it is each of our responsibility to articulate this force for ourselves. This very well might be what finding purpose is all about. Each one of us is capable of designing, painting, and engineering an immaculate hope. Furthermore, the tools we have received from this Cooper Union, and from each other will empower us to continually re-invent and build upon our blueprints. Let us ask ourselves, everyday, how we can embody a hope that stands upon the shoulders of our heroes, our parents, our leaders, our peers and our followers.